Enjoyed very much the TV play We’re Doomed! The Dad’s Army Story, in which the origins of the beloved sitcom Dad’s Army are explored. John Sessions absolutely CHANNELS the spirit of the late Arthur Lowe, with sterling lookalike and soundalike work from Ralph Riach as dour Scotsman John Laurie, a Shadowplay favourite, Shane Ritchie as Bill Pertwee, and Roy Hudd as Ray Flanagan, the thirties comedy star who sang the theme tune. NOT so successful, though fascinating as a piece of casting, is Julian Sands as John Le Mesurier. Le Mez was almost a special effect as much as an actor, a persona so unique and indefinable as to possibly defy impersonation. Sands’ best work in my view was THE KILLING FIELDS, where the man he was playing stuck around on set out of sheer vanity to see himself played by an actor, providing a handy reference point for the star into the bargain. Here, he doesn’t have the real man to refer to, and who among us can imagine Le Mez NOT acting? I’d like to think he was exactly the same in civilian life, but I have no idea. Another Dad’s Army star is Arnold Ridley, author of The Ghost Train, the theatrical comedy warhorse filmed multiple times, as silent, talkie, British, German, Hungarian, Romanian and Japanese. “I’d like to have your royalties,” someone says to him in We’re All Doomed! “So would I,” says Arnold, ruefully. This led me to look at THE WAY AHEAD, Carol Reed’s celebrated propaganda flick, written by Eric Ambler & Peter Ustinov (who also appears, along with most of British equity). The movie formed the basis for satirical treatments in HOW I WON THE WAR, CARRY ON SERGEANT and Dad’s Army itself, and in fact William Hartnell plays the sergeant-major in this and in the CARRY ON, with Laurie as a dour Scotsman in this and Dad’s Army. The Dad’s Army end credits, showing the aged cast trooping across a battlefield in a series of tracking shots, seems to deliberately reprise the climax of Reed’s film. When Powell & Pressburger made propaganda, their essential eccentricity always led them madly off-message and resulted in art rather than message-mongering. Reed’s film is more disciplined, therefore less artistic, and even though Ustinov hated the idiocy he was surrounded with in the armed forces, his script does an excellent job of celebrating the way the bickering, petty civilian raw material is shaped into a disciplined fighting unit by loveable David Niven and gruff-but-also-loveable Hartnell. There are only a few actual SHOTS in the first half, with a good deal of effective but perfunctory coverage, but at sea there’s a dramatic sequence, all staged full-scale, in which Reed finds that a sinking ship provides the ideal justification for his patented Deutsch tilts. Raymond Durgnat, our most imaginative critic, proposed that the true meaning of the climax, in which the heroes advance through concealing swathes of smoke, was this: “It can be read as saying, They’re all dead. Reed’s brief was to warn us, This is going to be worse than we can imagine.” The final shot, showing the old guard smiling at news in the papers, seems to quash this gloomy notion and compel us to presume the attack was a success, but those moments in the billowing whiteness do have an eerie uncertainty to them which defies the triumphal music. 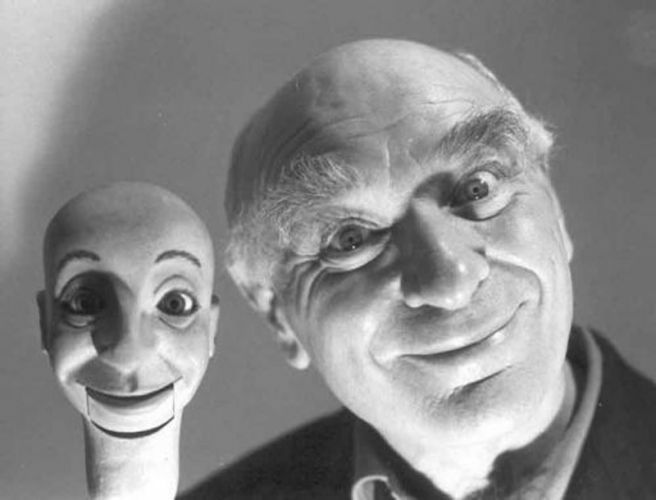 I saw Ken Campbell‘s TV play The Madness Museum when I was nineteen or so, and it stuck with me. Years later I met Campbell and even collaborated with him in a small way, but only this year did I manage to find a copy of the show. 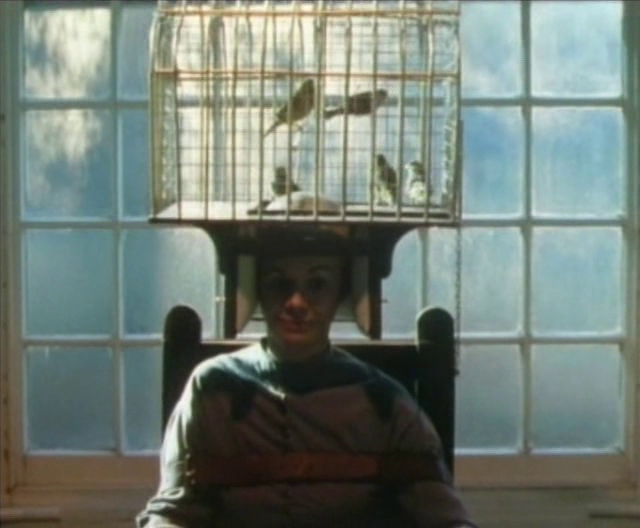 A fictionalized look at historical treatment of the insane, it features a fervid perf by Campbell himself as the Rev. Dr. Skipton, asylum proprietor with many revolutionary ideas, and young John Sessions (a Campbell protege) as his new assistant, Dr. Arthur Uwins. In this scene, Skipton’s water therapy/torture is deployed on Simon Callow, a very un-Campbellian actor, one might have thought — but in fact, Callow seems to fit right in, along with David Rappaport from TIME BANDITS and several other members of the Campbell stock company. 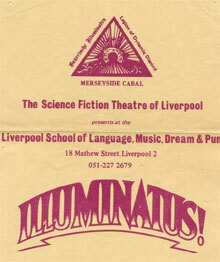 Rappaport was a primary school teacher when he answered an ad placed by Campbell to recruit actors and crew for The Science Fiction Theatre of Liverpool’s production of Illuminatus! — based on the giant three-volume SF satire by Robert Anton Wilson and Robert Shea. By chance, the book features a dwarf, Markoff Chaney (a guerilla ontologist fighting a lonely war against the concept of the average) and Campbell had been wondering how to cast the part. Rappaport could tell this story in such a way that it provoked a huge laugh, followed by the shocked sound of an audience trying to withdraw the explosive laugh back into their mouths and shamefully swallow it. 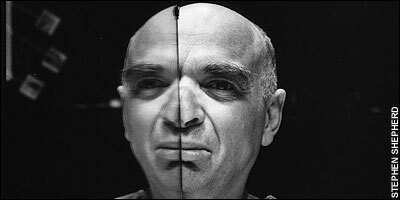 Using an arrangement of mirrors, Campbell presents an early rendition of his enantiodromic approach to acting. 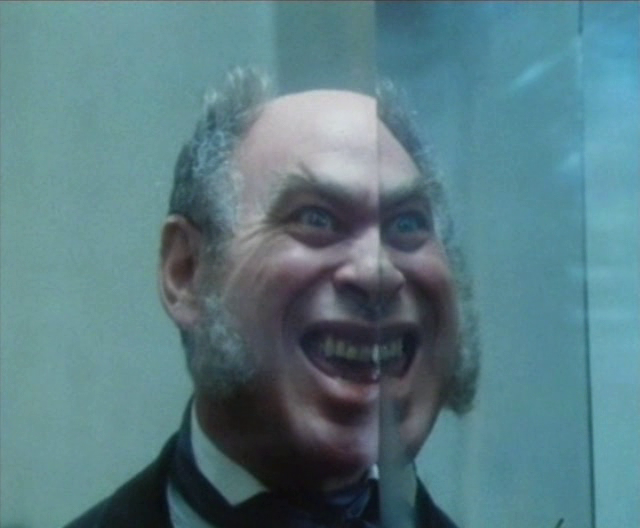 I think I first became aware of Ken Campbell via a TV play he wrote and starred in — The Madness Museum, dealing with experimental treatments for insanity in the Victorian era. A kind of blackly comic chamber of horrors. If anyone has a copy, I’d love to see it again. But I may already have read about him in Robert Anton Wilson’s Cosmic Trigger: Final Secret of the Illuminati, in which Wilson recounts how the Illuminatus! trilogy, which he co-wrote with Robert Shea, was adapted for the stage by Campbell and his Science Fiction Theatre of Liverpool as a nine-hour theatrical epic, somehow transferring to the National Theatre in a production featuring John Gielgud as the voice of the super-computer, FUCKUP. If so, I didn’t connect the two Ken Campbells. 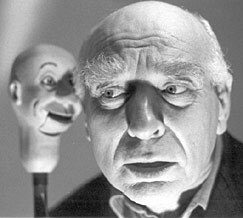 And due to some ambiguity in the credits of The Madness Museum, I wasn’t sure if the guy in the show was called Ken Campbell or John Sessions… But I knew which one I was primarily interested in. For dramatic effect, he popped his head in half an hour later and repeated, “Remember, don’t sell the film dictionary to the tall Chinese bird!” I think he perhaps only did this because I was chatting to a friend and it would mildly blow the guy’s mind. Campbell was at the Filmhouse to talk about SECRET NATION, a movie dealing with Canada’s sneaky annexation of Newfoundland, the London-born Campbell’s spiritual home. So I guess that dates the encounter to 1992. Again, if anybody has a copy of that film, which I’ve never seen, let me know. On comes this bald man with eyes like radioactive marbles under a porcupine conga line of bushy eyebrows, and proceeds to tell us “seekers” about the backstory of his epic theatre production Illuminatus! One part of this saga not covered in detail by Coveney is the origin of the project. Campbell’s attraction to Illuminatus!, based on the Yellow Submarine on the cover, is well-documented in Coveney’s book. His account of the play’s cult success, likewise. 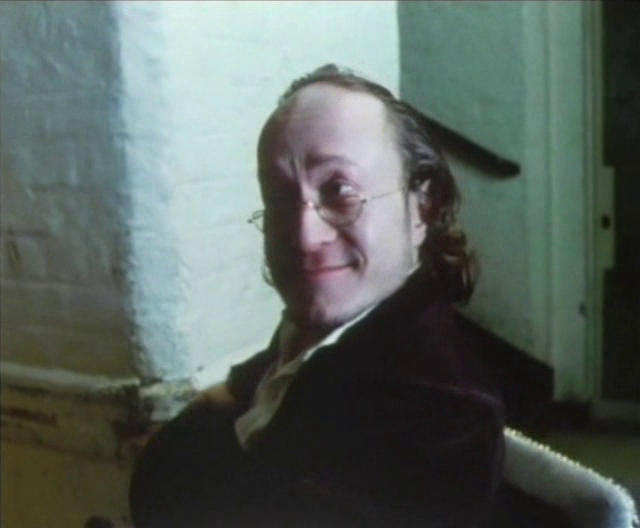 How TIME BANDIT leader David Rappaport, then working as a primary school teacher (“The most wonderful thing in the world is being able to look a child right in the eyes.”) had come in, apparently by chance, when they were looking for somebody to play anarchist dwarf Markoff Chaney (“The midget against the digits.”) How the play gave early roles to Bill Nighy, Jim Broadbent (Campbell, having discovered Bob Hoskins, had already released him into the wild) and Chris Langham (“Most British acting always seemed to be in the past tense, but Chris was always in the present tense”). How Bill Drummond (later of the KLF) had created heroic sets which eschewed the abstract to give science fiction fans the super-computers, yellow submarines and Atlantean domes they required — all on a stage the size of a dining table. Briefly, in the aftermath of the play, one of Campbell’s actors, cast as The Man Who Killed God, became increasingly preoccupied by the conspiracy theories recounted therein. At first he’d struggled to believe or get interested in any of it. Latterly he became obsessed. This was good for his performance, but it didn’t stop when the play finished its run. Campbell was called into the police station to explain all about “these illuminations”, by a very fat, jovial policeman. “I didn’t know you were allowed to be that fat and still be a policeman. “Your friend isn’t a criminal,” said the policeman, “He’s a nonsense case.” Apparently he’d strangled a bag lady, and then, uncertain whether perhaps his image would be recorded photographically on the retinas of her eyes, as the last thing she saw in life, he’d attempted to put her eyes out with a chair leg. Campbell attempted to explain his nine-hour play cycle. More policemen drifted in, making cups of tea. The day wore on, as the playwright-actor-director attempted to make the story fully explicable. The sun had set when he finished. “We must have evenings like this more often!” declared the policeman. A story to tell — Campbell had thought his deranged actor was put away for life. But in 1995, more or less cured — the paranoid schizophrenia he’d been diagnosed with under control — he was released, and Campbell retired Hail Eris! since he didn’t feel it was nice to be talking about the guy’s problems. The story is retold (with variations) in Coveney’s book, so I guess it’s OK now. He names the actor, I don’t, in case Campbell’s account is inaccurate and it might be doing the guy a disservice. 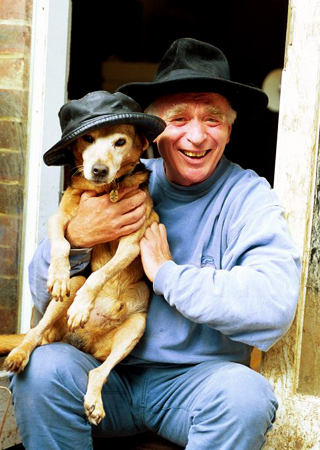 A fine documentary about Campbell, ANTIC VISIONARY, can be purchased here.